A few weeks ago my whole family went to Disneyland. It was the naughty nieces’ first time and I was busy making them princess dresses for each day (yeah I know I didn’t have princess dresses when I went to Disneyland as a kid and I only went for one day). 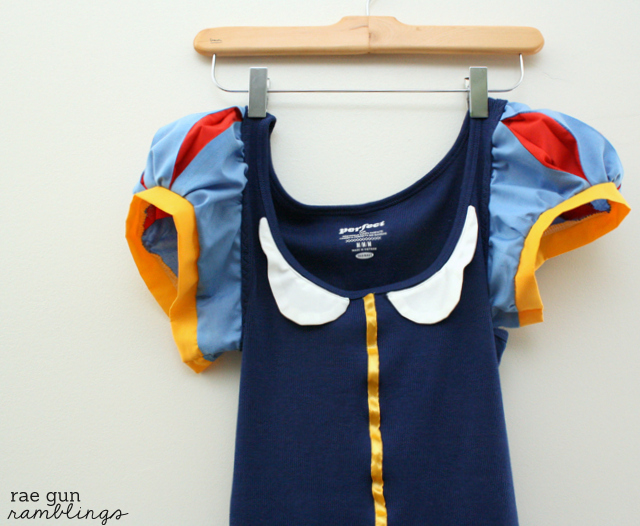 But I wanted to make a little something for me so I whipped up this cute upcycled tank Snow White shirt. It came together super quickly and when paired with a yellow knit skirt it was a super comfy fun outfit to wear to Disneyland. I had tons of people asking me about it so that was kinda fun. Start off by making the sleeves. 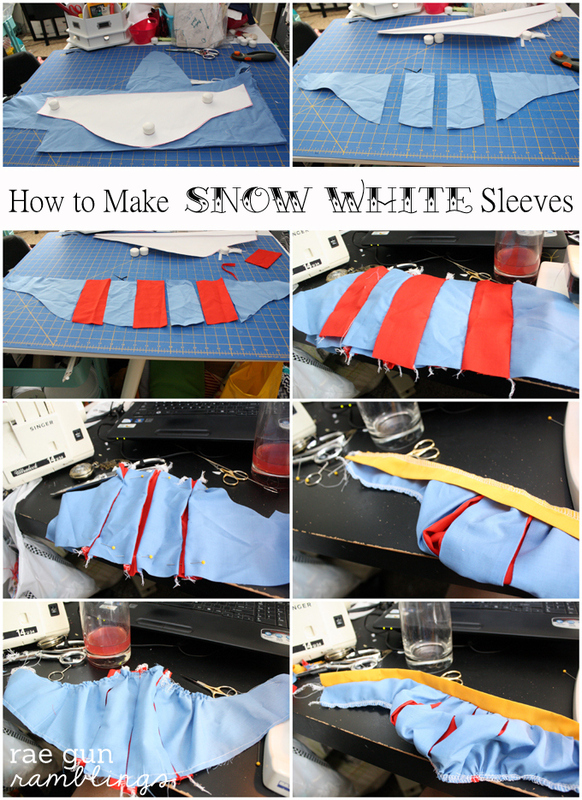 If you’re finding my description too fast be sure to check out my tutorial on how to make princess sleeves. I started by making myself a sleeve pattern. Take a sleeve pattern for a poofy sleeve (or just add some space in the middle to make it poofy) . Slit the sleeve 3 times to make room for the red pleats. Cut about 2 inch slits for each gap out of red. Sew the sleeve pieces together. Pleat the red part back folding each side of the blue on top of the red and pin. Sew basting stitches along both edges and gather. Fit to the arm hole of the tank and leave a few inches of extra space on each side since the armhole will stretch when you sew it on. Sew or serge finishing the edges of the sleeve. Iron a strip of yellow fabric long enough to go around your flexed bicep plus a few inches in half and sew/serge the raw edge of the strip to the bottom edge of your sleeve. Lay a piece of paper on top of your tank top and sketch a collar. I added 1/2 inch seam allowance but I wish I had made my collar a lot bigger. cut 4 collar pieces out of white fabric. Position your collar pieces on the shirt and sew along the top edge. Sew the ribbon down the middle of the shirt (I stitched a line on both edges of the ribbon). So this part is a tiny bit tricky you can fit the sleeve to the tank and sew the sleeve closed but know that it will stretch so I’d make the sleeve circle a few inches bigger than the tank armhole. I did not do this so my tank had extra space at the arm pit. I just folded it and called it a cooling area. If I were to do it again I would stay stitch the tank armhole first allowing it to stretch a little since I don’t like cramped armholes. Then I’d fit the sleeve to the armhole and then you won’t have to worry about the sizes not matching and set in the sleeve how you would on any garment. And here are some cute pictures that my sister took of me and the girls in our outfits. That day L wore her Belle Dress and T wore her Jasmine outfit. I’ll have tutorials for both their outfits up soon. Such a fun idea. And who wouldn’t want to get on some princess dress up action. You are crazy talented lady. Thanks so much Anne I really appreciate it! SO cute!! You are so creative! :) Can’t wait to see the other princess tutorials! This is so fun! You looks so cute in it! You are so talented. I love how original this is. What a fun idea! You are such a cute aunt. That is so adorable and I love, love that you dressed up with the girls! Making memories… that’s what it’s all about! this is awesome. Thanks for the great idea and pics. Marissa!!!!! This is DARLING! I for real might make this far Halloween. Unless you can come up with an Arial one for me :) You’re my feature for Made With Love today! 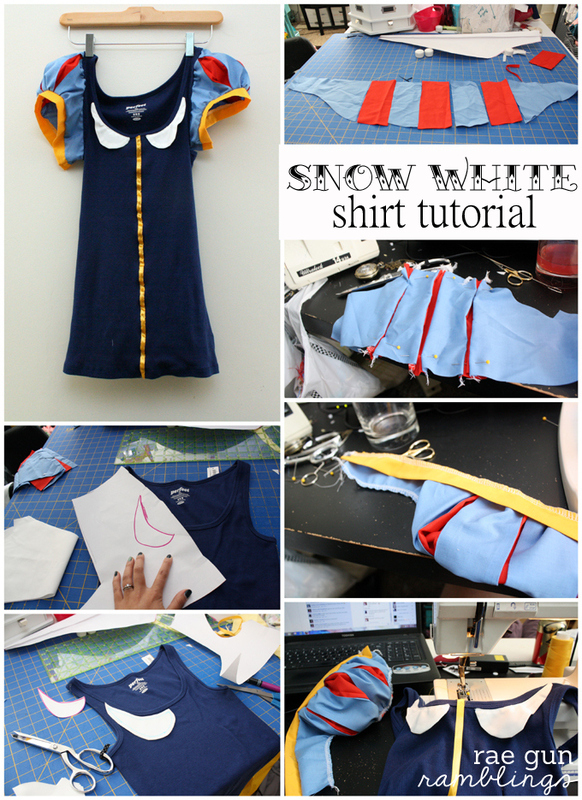 I’m in the process of making a Snow White shirt for my trip to Disney World next month. I’ll be attending Mickey’s Not So Scary Halloween party and I wanted to dress up without wearing a full on costume. I did pretty much the same thing but with a t-shirt instead of a tank as I’m a “Pooh” sized gal. I was able to find a pair of yellow capris ($7), a yellow skirt ($5), a dark blue t-shirt ($3), and a light blue t-shirt ($3) all at my local walmart on the clearance rack. I bought both the capris and skirt as I’m not sure which I want to wear yet. I took the sleeves off both shirts and sewed the light blue sleeves on to the dark blue, adding loops of red ribbon and trimmed it with yellow ribbon. I found an apple purse and red hair bow online to complete my look. soo doing this for halloween. thanks for the great idea! Great Tutorial! 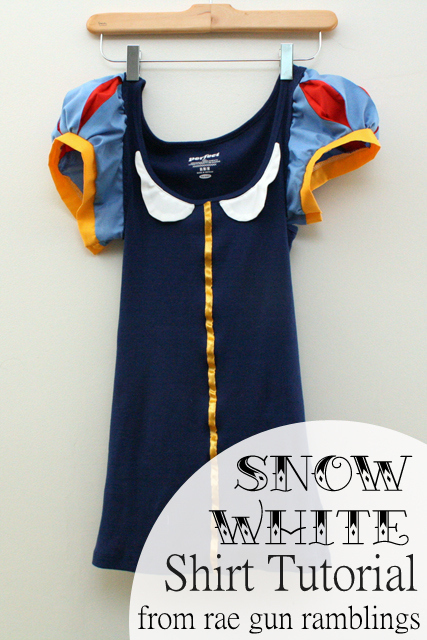 Im Made a Snow White Dress for my daughter some weeks ago (here: http://kariko-aktiv.blogspot.de/2014/07/sunny-schneewittchen.html) It would have been easier for me, if I had your tutorial before. I love this idea! So cute, what a great halloween/dress up. idea. Thank you for sharing at Dream. Create. Inspire. Link! Okay, this is genius! 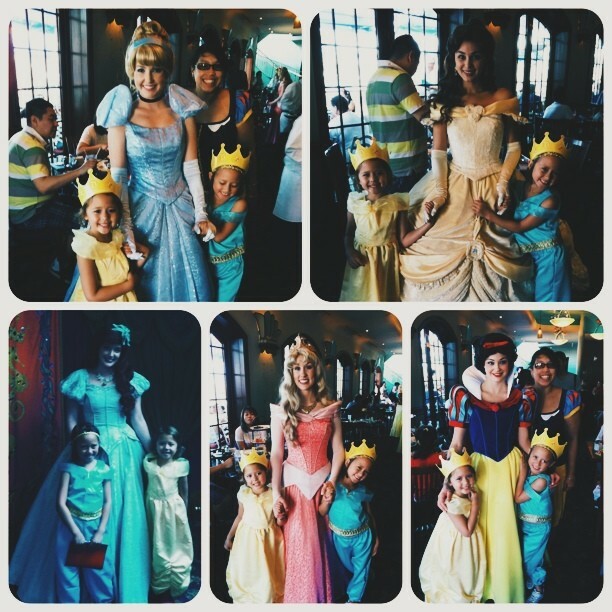 I love that you made your nieces princess dresses – what an aunt! I’m actually attempting my first dress sewing for my little girls to be Anna and Elsa for Halloween (there was no convincing them otherwise…) I’m sure you and your nieces were the best dressed in Disney!